Julie knew that it was a losing battle from the very beginning. It is common knowledge that the majority of the wedding details rested on the whims and fancies of the mother of the bride. Julie knew this, especially after living under her mother's carefully guarded wing for the last twenty-three years, but she had held out hope that maybe her mother would concede to her wishes when it came to the most important element-- The Dress. Aside from the choice of who would be standing next to her at the altar, the entire celebration revolved around the bride's choice of what she would wear. The Dress. It was daunting to think of the pressure to find just the right one, one that was all Julie, and showcased just how radiantly happy she was. Would she go with sweet and innocent, with billows of silky flounces bobbing with her every step, or perhaps regal and elegant, with a high lace neckline and sweeping train, a dignified nod to the classic style of Grace Kelley? Or would she dare bare it all, with an alluring and oh-so-female snug waist and hip, showing just enough skin to remind Nathan why he proposed to her in the first place? Every dress Julie tried on seemed to fit her in a different way, matching each unique and varied part of her personality. But what was ALL HER? Her mother's voice was so loud and determined during each attempt at a new gown, that Julie found herself drowning in more than just a lake of ivory, ecru, and cream-colored silks. Connie seemed to have an opinion on everything and was not afraid to let it be known. With the authority that only a mother of the bride could exude, she picked at each selection, tearing them apart with her scissor-sharp words of distaste. Oh no, that one simply won't do. It makes your hips look much too wide, dear, with the waist banded like that....Oooh, that one is decent, if it didn't have that horrid ornament on your shoulder like some sort of vulture. What were they thinking with those feathers....? I like the skirt, but the ruffles around the bottom are way too much, they would over power your delicate frame, my dear....This IS a designer boutique, isn't it? I am underwhelmed with the designers represented here! Julie pretended she didn't see the eye-roll her dressing assistant tried to smother. She knew what the woman was thinking. After all, the same train of thoughts had coursed through her mind since she was young. Her mother could be so demanding and condescending. She expected the best from everyone, and had a definite idea of what their best ought to be. Julie's grandfather began a law firm in Chicago in the early 1940's, establishing a clientele of questionable moral character, creating a highly lucrative business. Her father, Frank DiCarlo, now ran the firm, and under his iron hand, had controlled and created connections all over the country. He tried publicly to weed out the clients with a more seedy past, yet Julie suspected there was a lot more that went on behind the closed doors of his office on those late nights. Her mother, Connie, remained oblivious to the business affairs of her husband, or possibly chose to remain so. She reveled in the DiCarlo status that afforded her expensive shopping trips and the multi-million dollar penthouse apartment in downtown Chicago. Julie could hardly believe that her mother had come from any other background than the highly privileged. She acted as though it was all she had ever known, despite the fact that she had been a waitress in a small Italian restaurant when she met her tycoon husband. She slipped on the role of DiCarlo's wife without even a hitch, demanding loyalty and perfection from staff and servant. When Julie and Nathan had announced their engagement at a family dinner party, Connie had gone into hysterics of excitement and planning. She knew the best shops in Chicago, and what designers were the current favorites of the elite. "We must find you a Monique Lhuillier, or maybe a Lazaro. The Perasso girl wore one of his, and Patricia swears he has the most divine collection." "I haven't decided yet what type of wedding I want, Mom," Julie interjected quickly. "Isn't that where you start first?" "Oh pshah!" Connie dismissed derisively. "We will start with the most important element first....the designer, of course!" So now here they were trying to get, in Connie's mind, Chicago's Wedding of the Century, underway by selecting the pivotal dress. But how could Julie ever decide on the perfect gown when she didn't even know entirely who she was? She no longer wanted to be Connie DiCarlo's quiet and mousey daughter, hiding in the shadows, letting her mother make every decision for her. When she said "yes" to Nathan, she was choosing to be Julie, the Bride. But who was Julie, the Bride? Connie abruptly declared the afternoon a disaster, pulled her cell phone out and within 90 seconds Gino their driver was standing on the curb with the back door of the Mercedes open waiting for them. Julie couldn’t quite read the expression on the assistant’s face when she came out of the back room with yet another gown and witnessed them leaving. Julie guessed she was half annoyed at the trouble and half relieved they were going to be some other bridal boutique’s problem now. Connie marched toward the door, never bothering to announce their departure while Julie shrugged her shoulders and whispered an apology to the assistant before she scurried after her mother. Over an early dinner at Keefer’s, Julie tried yet again to explain her vision of The Dress to her mother, but Connie interrupted with an idea for a trip to New York to continue their search. Julie let her drone on as she half-heartedly grazed on her salad. Julie would have ordered the house specialty prime rib—spending time with her mother was emotionally and physically exhausting and she could really work up an appetite—but she knew her mother would have eventually made some reference to her figure. Sometimes it was just easier to go along with her mom. Once they were home and out of her mother’s view, she’d grab something a little heartier. Julie gratefully left her mother in the foyer and made her way to her bedroom in the penthouse she was temporarily sharing with her parents while biding her time before the wedding. She’d given up the apartment she’d rented with her two friends upon graduating the year before. She flopped onto the bed and sighed dramatically, her palms rubbing deep into her eyes. How was a wedding that was supposed to celebrate so much joy becoming so depressing? She wished she could snap her fingers and have the wedding arrive tomorrow. At the thought, Julie sat bolt upright on the bed. Would elopement be a forgivable offense as far as her mother was concerned? She knew Nathan would be up for it. He listened to all the wedding plans with a bemused smile. He didn’t care about the wedding so much as he did about Julie. Julie weighed the positives and negatives in her mind. On the bright side, she would have Nathan as her husband right away instead of waiting another nine months. Although she’d dreamed of her wedding like most girls, Julie was certainly more interested in the lifetime marriage than in the one day wedding. Every decision would be entirely hers (or hers and Nathan’s, hurray!). And the number of decisions would be so much smaller anyway. No caterer, no florist, no venue to fit 200 guests, no seating arrangements, no six tiered cake. There would be no need to monitor Scooter (Nathan’s college buddy and, in Julie’s private opinion, questionable choice for a best man) to see how much booze he had consumed prior to attempting a toast. And no first dance put on for the benefit of Chicago’s elite with all her mother’s friends, acquaintances, and rivals judging her footwork and designer dress. Julie’s spirit felt buoyant as the thought of either going to battle or conceding to her mother on every aspect of the wedding fell off her shoulders. She forced herself to examine the negatives before she escaped her parents’ penthouse that instant. If they eloped, she and Nathan would be trading in opulence for a bare bones ceremony. For starters, they would miss out on the presents. Julie tried, but couldn’t really make herself feel sad about that one. All her mother’s friends tried to outdo themselves with beautiful, but relatively useless gifts. How many cut crystal champagne buckets could one couple use anyway? A huge, huge negative would be no family. As much as Connie stressed her out and didn’t seem to get her, she was still her mother and she loved her. Was it right to deny the mother-of-the-bride a wedding? And Julie and her dad had a fun, loving relationship. Would he be okay with not walking her down the aisle? Nathan’s mother had passed away years ago. His father was in a care facility for people with early onset Alzheimer’s. She knew that considering how to include him in the wedding was a big stressor for Nathan. Nathan was the youngest of four brothers, but they were all pretty low-key. Julie suddenly remembered that Patricia, one of Nathan’s sisters-in-law had told them that her father had offered her $20,000 cash if she and Nathan’s brother Andrew would just elope and they had seriously considered it. Julie had laughed at the time, wondering why anyone would give up their once in a lifetime dream wedding. It was looking pretty reasonable right about now. Julie continued contemplating. A final negative. Was sacrificing her vision of The Dress worth freeing herself from her mother’s grip? Julie pushed The Dress to the back of her mind and phoned for a taxi. She would surprise Nathan when she got to his place. She dumped her workout gear onto the floor of the closet and started stuffing items into its zippered mouth. She grabbed her cosmetics bag too and then stuck her head back into the closet for a final check. She walked to the back and ran her hand over the special occasion dresses covered in drycleaner bags. Her hands paused on the simple pale blue sheath dress that she had worn the day Nathan and she had first met at the Russos’ garden party. Making her decision, she pulled the dress off the hanger and then grabbed a pair of fun strappy sandals and stuffed them into the bag. Too late, she realized she should have just started out with her regular suitcase, but it was stored downstairs and she’d have to walk by her mother and her questions to retrieve it. Julie snuck into the hall and then felt silly. She was 23 and a grown woman making a grown-up decision to elope, not a 13 year old running away from home. She’d just march downstairs and tell her parents what was what. Julie resolutely made her way down the stairs, her gym bag in tow. Just as she was about to seek out her mother, she heard Connie’s steely voice from the kitchen questioning Carlotta about some aspect of housekeeping. Julie lost her nerve and dropped behind the couch. She commando-crawled out the front door. Outside in the fresh air, Julie felt slightly giddy but mostly nauseous as she climbed into her escape car. The taxi smelled of cheap perfume and stale smoke, but the odors of the real world excited Julie. She gave the driver the address of her destination and looked back as her home and her problems seemed to reduce in size. Her driver looked back at her in the rear view mirror a few times and laughed as Julie’s facial expressions evolved from excitement, to nervousness, to flat out fear. “About. I’m not running away though. And I’m not scared.” Julie looked out the side window and silently wished the driver would stop talking so she could put her thoughts in order. “I left home at 18. I met me a girl, a classy girl, and convinced her to marry me. Her daddy didn’t like me none, so we did the only logical thing at the time and eloped. When we came back home a month later, she was pregnant with our first son. Her daddy didn’t like me any better after that.” He laughed at his own story and looked back at Julie to see if she found it as amusing as he did. She didn’t. Al, pulled off on to the shoulder and turned around to look Julie in the eye. “Some days yes, some days no. My wife shoulda had her mama there, but we weren’t thinking about any of that. We just wanted what we wanted. It was simple, and sweet and in the end all turned out alright, but lookin’ back I wish I would have made it more special for Mary, my wife. Love is grand, ain’t it? Complicates and simplifies everything, don’t it? When the time comes, you’ll know what to do.” He patted her arm and turned back around quietly. Suddenly, Julie felt the enormity of the choices she’d be making . Like dominos, she had to place them with exactness, and be prepared for them to either fall beautifully or come crashing down around her. Each choice from here on out determined the outcome of another chain of events. 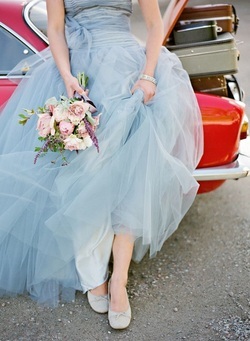 She looked at the pale blue dress crammed in to her over-stuffed bag. The store assistant looked up with an impatient expression when Julie walked in. Julie remembered it was almost closing time. Julie stared in the mirror by the dressing rooms while she waited. The store was quiet and her mind was still reeling. What was she going to do? Really, was she going to buy her dress on her own, go to Nathan's and elope? Was she going to chicken out and go home to her parents? Suddenly her cell phone rang, startling her. She quickly answered it, a reflex to not draw attention to herself. It was Nathan. “So how was dress shopping?” he asked warmly. He sounded amused. “About what you’d expect,” Julie said. “Nathan?” Julie said, “I have a crazy idea.” Her heart started pounding. “Let’s elope,” she blurted out. Oh, why does he have to be such a good guy? Julie lamented in her mind. “OK,” he said. Did he sound a little unsure? Julie decided not to notice. After she hung up the phone, the store clerk was standing there holding three dresses, mouth agape. She had been listening to the conversation, but for how long? She had an expression like a cat ready to pounce. “Here you go, Ms. DiCarlo,” she said. Julie looked shocked. How did she know her name? Color rose in Julie’s face and it burned hot. Now what? Was this woman going to tell anybody? Did it matter? It had always seemed ridiculous when her mother said they had a position in the community. It was Chicago! They were anonymous! Now Julie wasn’t so sure. She thought of the thousands and thousands of dollars her mother was willing to spend on her wedding. It would matter. “Excuse me,” Julie said, and she fled the store. Outside she saw her taxi waiting and she quickly climbed inside and gave him Nathan's address. She would go to Nathan's and figure it all out. Inside the store, the clerk picked up the phone called their sister store and got the home phone number for the DiCarlo's and before she could think better of it, called their home. "DiCarlo residence," said the voice on the other end of the phone. "Hello, I'd like to speak with Mrs. DiCarlo." "Can I tell her who's calling?" said the voice. "Yes, this is Rosie McDonnell calling about her daughter Julie's wedding dress." "Hello, this is Mrs. DiCarlo. I hear you are calling about my daughter's wedding dress but she hasn't picked one yet so what is this about?" said Connie DiCarlo. "I know she hasn't picked one yet. She was just in my shop about to try on some dresses when I overheard her talking to her fiance about eloping. I confronted her before she had even tried on one dress and she bolted out the door. I thought you needed to know what your daughter was thinking," said Rosie. "My daughter was thinking about eloping? Preposterous! She wouldn't dare. She wouldn't do that to her own mother." "Well, m'am, she was talking to a man named Nathan and I did recognize her from her engagement picture that was in the paper last week," said Rosie who dutifully read the engagement announcements and who wasn't about to explain what she had heard about the mother of the bride earlier today. "Well, she is marrying a Nathan....where did you say your shop was?" Connie asked. Connie was beginning to panic. If this were true, this would be disastrous. A DiCarlo does not elope like a commoner. People will think we have something to hide and Julie is not pregnant! Is she? Oh no! I have got to get a hold of that girl. "Wait, I missed what you said. Where are you located?" asked Connie again. "Our shop is called A Little Wedding Boutique, you visited out sister store earlier today. We are located on Cottage Grove Ave near the north side of Washington Park," said Rosie. Connie realized that if Julie had gotten in a taxi, she would have had to pass right by that store on her way to Nathan's apartment. It made sense and it terrified her. Her little girl, her only little girl could not elope. Not only would there be a scandal to deal with but she wouldn't get to see her little girl get married in a church with all her friends and family surrounding her. Nothing could be worse than that. She had to stop those two and she wasn't going to do it alone. "Thank-you Rosie for letting me know what you heard. As you can imagine, I don't have time to talk right now but my thanks for your information and discretion in this matter. I'll be in touch with your little boutique in the future to see about a dress for Julie," said Connie hanging up the phone and hoping that the prospect of a future client would keep the girls mouth shut. Connie quickly picked up the phone and dialed her husband's direct line. "Hello dear, I've just found out that our daughter is planning on eloping. I will be at your office in 15 minutes and I need you to be out on the sidewalk waiting for me and we will go talk some sense into OUR daughter." "Connie, I think you are overreacting. Tell me what our daughter said. It can't be that bad," said Frank DiCarlo. He was using his "my crazy wife" tone and it was driving Connie crazy. "You don't understand. I haven't talked to Julie yet. Some dress attendant at a wedding dress store overheard her talking on the phone to Nathan and they were planning to elope right away. Julie was there to get a wedding dress. When the attendant confronted her about eloping, Julie bolted and I need you there to talk some sense into her," said Connie. "Connie, call Julie and see if she really is planning on eloping and then call me back. I've got to get back to this meeting," said Frank. "I can't call her because then she'll be onto me and she'll turn off her phone and she and Nathan will be on the run and there won't be anything I can do about it. I'll be there in 15 minutes and we are going to head them off at Nathan's apartment and confront them about this elopement," said Connie. "Connie, be reasonable. I can't leave right now. I'm in the middle of a meeting with clients who are going to trial next week. I need to be here to confer with them. Go and talk to Julie and keep me posted," said Frank. "No Frank. I have run this family the best I could every day, every hour, every year while you were off working with some big client. I didn't make you do all the little things other father's do but I will not do this alone. It's too big and too important and quite frankly, I'm a little afraid I will screw it up. You have to be there. Make whatever excuses you have to to your clients. You can work 24 hours a day next week but if our little girl elopes, I will blame you forever. I'll be there in 10 minutes. Please be waiting on the curb," said Connie. "I'll see what I can do," said Frank who was beginning to worry about the sanity of his wife who had always managed to take care of everything before this. What was he supposed to do, and if his little girl really was intent on eloping, how was he going to get her to stop, for he knew Connie's threat was not an idle one. As the taxi pulled up to Nathan’s apartment, Julie’s nerves took over. She felt dizzy and sick to her stomach. What was she going to do? Nathan opened the door to his apartment before she could even knock. At the look on her face, he immediately drew her into a tight hug. “That bad, huh?” he asked, his lips brushing lightly across her hair. She squeezed him tighter. Oh, she loved this man! Pulling back, Julie said, “Nathan, I just can’t handle any more of this. You know how my mother is. There is no way our wedding day is going to be about us, unless we take control and just escape!” She knew that he could hear the desperation in her voice. Relief flooded through her. Julie hugged Nathan again. “Thank you for understanding!” She kissed him, and he responded with a passionate kiss of his own. Fumbling with the door behind him, he half carried Julie into his apartment. Of course, Nathan hadn’t lived with a female for a long time, not since his mother passed. He didn’t realize that asking a woman to get ready in a few minutes was completely out of the question. Thirty minutes later, Julie emerged from the bathroom, a vision in pale blue. Her hair was pulled back in a loose chignon at the base of her neck, revealing the sparkling diamond studs on her ears, understated and elegant, and she held her cream-colored clutch tightly in hand. She was glad that she had sprung for the deep red lipstick the girl at the Chanel counter raved about. Julie had never worn red lipstick before, and was surprised to find how it made her skin glow. She felt amazing. New. Radiant. Perfect. Julie giggled self-consciously, and felt herself blush. “Let’s get out of here!” she said. Nathan picked up both their bags and headed for the door. Turning the knob, they ended up face to face with Julie’s parents, her mother with her hand poised and ready to issue her first authoritative knock. “Mom! Daddy! What are you doing here?” Julie asked, astounded. This was the last thing she expected. She couldn’t even manage to run away effectively, without her parents following close on her heals. “I might ask the same thing of you, young lady,” Connie started, a stern look on her face. “Ahem…” her father interjected, and there was a not-so-subtle look passed between the two of them. “What your mother means to say is,” he started slowly, but then dropped off with an awkward grunt. After a pause, he seemed to pull himself together and addressed Julie again. Julie looked down for a moment, unsettled by her father’s approach. She sensed Nathan’s nervous shifting around behind her. Suddenly she was filled with a new resolve. This was hers and Nathan’s decision. They were adults. She didn’t need her parents’ approval. They both already loved Nathan. He was a wonderful man, and they made a great couple together. Only thirty minutes earlier, she had been a nervous little bird, anxiously retouching her makeup, adjusting her hair. But something changed as she saw herself evolving. Her hair, her old blue dress, her immaculate red lips, her little diamond stud earrings, a gift from her father when she graduated from college….She watched as she became Julie the Bride. It was what she had wanted from the beginning. Let them try to stop her. A gasp escaped her mother’s lips, but was quickly stifled. Julie and Nathan looked at each other, an unspoken question between them. “Then we will catch a flight to Las Vegas. It never matters what time it is in Vegas,” Julie stammered. Julie also looked stunned. Had her father just offered to help her with her frenzied shot-gun of an elopement? Julie rushed into his arms, and was enfolded into the warmth of the other man in her life. Looking to Nathan for his enthusiastic approval, she agreed to the arrangement. Back in the car, with Julie and Nathan following behind in his rattling little Fiat, Connie came down on her husband. “What are you thinking? !” she wailed. “Between the two of us, I think we can make some magic happen,” was Frank’s reply. An hour later, Julie walked through the front entryway of her childhood home and into the parlor, on the arm of her beaming father. She carried a lovely round bouquet of white roses and violets, wrapped in a pale blue ribbon, accenting her simple dress. Fastened in the front of her hair was a vintage ivory half-veil, draping sweetly over her eyes. And her newly discovered shade of red was not the only thing that played across her lips…the radiant smile present even managed to tease her dimples into action. Julie the Bride was here. An old friend of her father’s, Pastor Francis from St. John’s Parish, conducted the happy service. The bride and bridegroom simply glowed, repeating their vows in a hushed reverence. Tears were shed by all, including the proud mother-of –the-bride. “Congratulations, honey,” she whispered warmly, embracing her daughter after the ceremony. “Thank you, Mom, for everything,” Julie said, her eyes still brimming with tears. The two of them laughed and hugged again. Frank shook Nathan’s hand, welcoming him into the family, and secretly congratulating himself in having saved a fortune, as well as saving the day.